Artemis (Diana in Roman mythology) was the virgin goddess of the hunt, wild animals, chastity, the moon, and childbirth (to a lesser extent). She was the daughter of Zeus and Leto, a titan, as well as the twin sister of Apollo. She was an Olympian goddess, and was extremely important in several parts of the ancient Greek religion. She is described in Homeric Hymn 27 as “Artemis of the gold shafts […] the modest virgin, the deer-shooter profuse of arrows, own sister to Apollo of the golden sword,” (Homer 209). She was a popular patron goddess of agrarian areas, due to her association with the wilderness. Artemis was worshipped in many places, but her sanctuary at Brauron was one of the paramount sites. 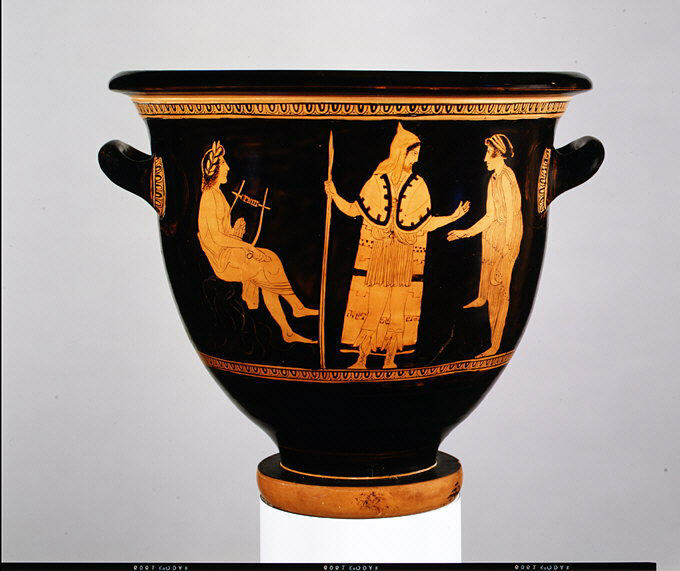 Many young Athenian girls were sent there to participate in a ritual called the arkteia. The arkteia prepared these girls, between 7 to 10 years of age, for puberty and marriage and the transition into being a woman. Because of this, Artemis was also considered a goddess of rites of passage. 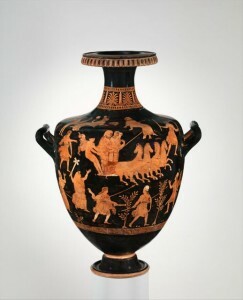 In Greek myth, Artemis defended her chastity so thoroughly, that when Actaeon came upon her bathing, she turned him into a stag so that his hunting dogs would tear him to pieces. “Tell, if thou can’st, the wond’rous sight disclos’d, a Goddess naked to thy view expos’d” (Ovid 3.192) she announced, before allowing his former companions to devour him. 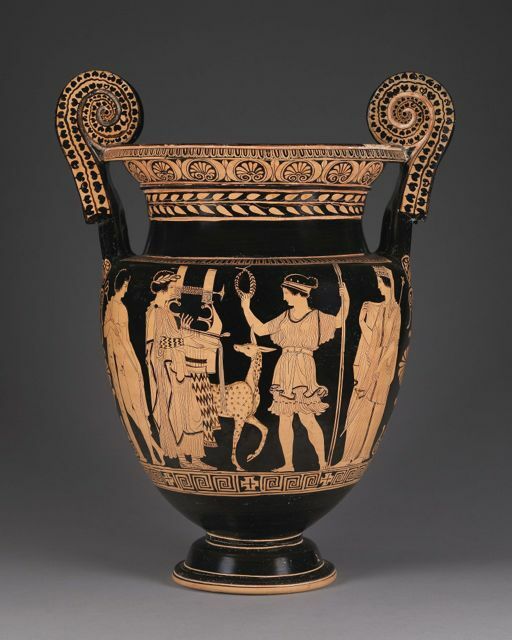 In the vase pictured here Artemis can be seen on the middle right, identifiable due to the attributes of the sacred deer and the bow in her hand. To her left is her twin brother, Apollo, and to her right is her mother, Leto. 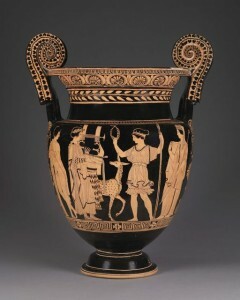 The god, Hermes, is standing on the far left next to Apollo. In Artemis’ right hand, we see her holding a crown of laurels, which is an important symbol of her brother. The vase is mostly depicting the family, who played a large role in the Greek religion. Both Apollo and Athena were seen as gods of puberty, though each for their own sexes, due to their association with rites of passage. It’s not hard to see why Artemis was an important figure in the Greco-Roman pantheon, after all the accomplishments she had, as well as all of the deaths that she was responsible for. “Brauron.” In Stoa. Last modified February 13, 2015. Homer, Homeric Hymns, trans. West, M. April, 2003.